Well it certainly has been a hectic few weeks and as usual I've probably bitten off more than I can chew considering my family's circumstances. Lets just say that there has been an over abundance of medical issues in my close and extended family and some prayers would be most welcome. Okay staying positive - I took Bonnie Ronnie for a drive in the country to cheer her up and of course I had my trusty Sony a65 camera in the boot (wish I had a 4WD). During our travels we couldn't help but notice the build up of cloud on what started as a clear blue sky day. It seemed the further and higher we travelled the greater the cumulus. The views were spectacular and made more so by the heavily pregnant cumulus and I just had to stop (carefully as the ground was a bit sodden and my little front wheel drive doesn't like 'sodden') and take a few photographs - I thought what a perfect opportunity for a spectacular panorama but unfortunately I muffed that, ...yes I make mistakes and truth be told - a lot of mistakes! I did however get some great images which I have posted on our FB page while Ronnie relaxed to some great music as she took in the views. 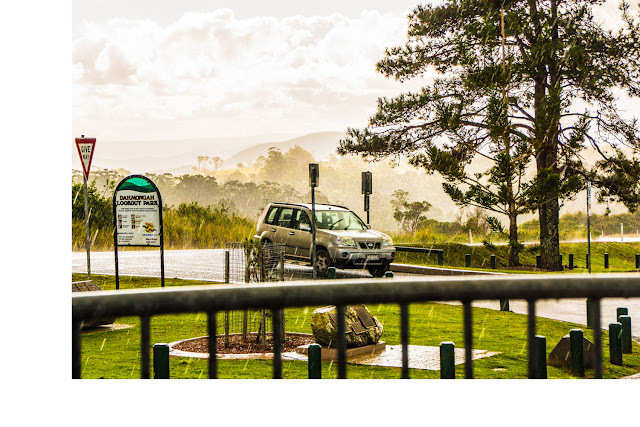 We wound up at Mt Mee which is located about 20km (as the crow flies) inland from the Sunshine Coast with spectacular views to the ocean and to Brisbane but just a little too far for the camera to capture with the lens I had with me. 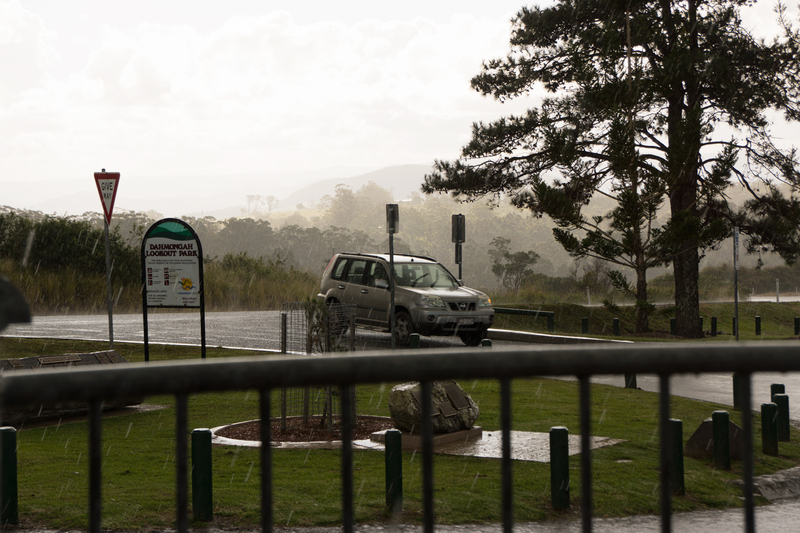 By the time we got to Dahmongah Lookout Park, the heavens had given birth to a wonderful downpour of rain, however the views were pretty well shot - no pun intended. I took a few images anyway, I always shoot in RAW and it is amazing just what the camera does catch. I've just upgraded to Lr5 and this is the first photograph that I have processed with this new version. I thought I might step through the process I used. The top picture is obviously the original image straight out of the Sony SLT a65 using DT 18-250mm f3.5-6.3 lens, focal length 55mm ISO 100 1/160th sec at f6.3 RAW format. Shot in Priority mode. In Lightroom 5 - Firstly I cropped the image to remove a distraction from the left and the bottom of the image so that the composition made use of the lines to draw the viewer into the story. As I do with every image I checked the WB (White Balance) and determined that I would go with 'As Shot' (since it was correct in camera anyway). I usually then move straight to 'Presence' as I did here and set 'Clarity' to +86 (a bit high but it was raining and I wanted to bring out the rain trails). 'Vibrance' was set to +75 again pumped up pretty high to make some of the detail pop (of course this introduces quite a bit of noise and thats why I shoot at ISO 100 wherever possible). 'Saturation' is set at +21 as the rain washes out a lot of colour and this ensures that detail which will be brought out has quite a bit of colour and tonal contrast. Next I adjusted the 'Tone' - increased the 'Shadows' to +66 (one needs to keep an eye on the histogram here ...and at all times as we want to avoid any 'clipping' (no data for print)) this will usually produce a blowout of 'Highlights' so I reduced them to -56 and reduced the 'Whites' to -46 all of which produced clipping in the darks to I increased 'Blacks' to +30. From here I usually move to 'Tone Curve' and play with the curve in the histogram to produce the detail and effect that I'm looking for typically a slight 'S' curve as in this case but I really pull this curve in every direction starting large and refining as I go with a little tweak to the above settings here and there. There is no set formula it is all about you and your story. In this case only the 'Lights' +34 and 'Darks' -24 were adjusted. Then I went directly to 'Lens Corrections' but I just enabled 'Remove Chromatic Aberration' as all I wanted to do was ensure that the rain trails didn't contain any green or purple. That is it. Now you are probably wondering what this last image is all about. I sometimes find that even though I can extract a lot of detail from the RAW format it doesn't quite give me what I'm looking for - usually a little larger than life look ....a little surreal I suppose ...extra pop if you like, ...whatever you want to call it. So I created a third copy of the original image and opened it in Color Efex Pro 4 from Nik (a fantastic set of tools for all photographers). I applied only 2 filters - 'Detail Extractor' to the whole image with all settings in single digits and 'Tonal Contrast' with settings between 9-25 High Pass. Note the extra detail especially in the cloud and in the dominant tree. Ronnie always says it's too much for her taste but I like it - what do you think?